When it was all over, Wolfe had a bullet in the arm-and the killer had one in the heart. 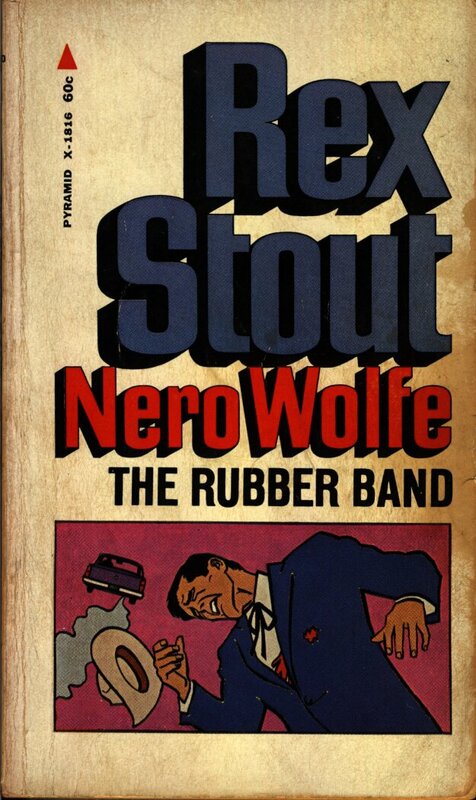 But before the shoot-out in the fat detective’s office, Wolfe and Archie had to break the mystery of a “Rubber Band” that stretched across forty years and five thousand miles-a mystery made up of a lynching, multiple murder, blackmail, and one of Nero Wolfe’s most dangerous-and lovely-clients! 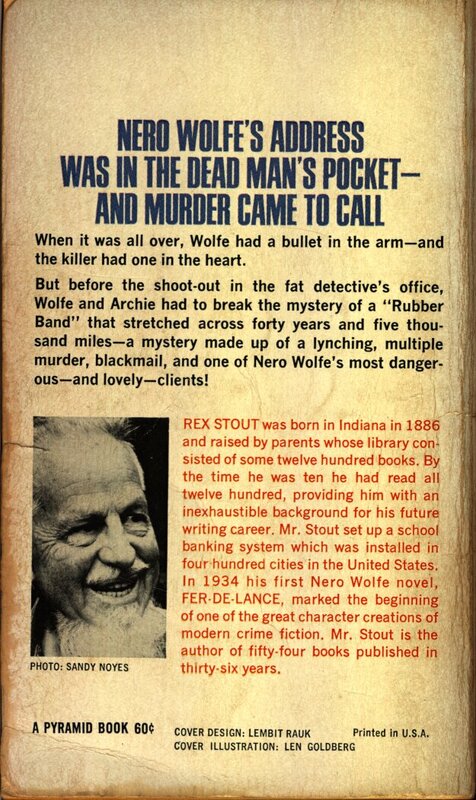 REX STOUT was born in Indiana in 1886 and raised by parents whose library consisted of some twelve hundred books. By the time he was ten he had read all twelve hundred, providing him with an inexhaustible background for his future writing career. Mr. Stout set up a school banking system which was installed in four hundred cities in the United States. 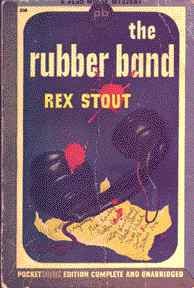 In 1934 his first Nero Wolfe novel FER-DE-LANCE, marked the beginning of one of the great character creations of modern crime fiction. Mr. Stout is the author of fifty-four books published in thirty-six years. Clara Fox came to Nero Wolfe for help – she’d been accused of stealing from her bosses, and wanted him to prove she hadn’t done it. and a warrant for his arrest! The following is an excerpt from NERO WOLFE of West Thirty-Fifth Street by William S. Baring-Gould pertaining toTHE RUBBER BAND. When it was all over, Wolfe had a bullet in the arm, and the killer of two men had one in his heart. But before the shoot-out in Wolfe’s office, he and Archie had to break a mystery that stretched across forty years and five thousand miles, a mystery in which lynching and blackmail, a devilish alibi and a warrant for Wolfe’s arrest all played a part. Anthony D. Perry came to Wolfe for help for the second time on Monday, October 7, 1935; Wolfe solved the complicated case only two days later, on Wednesday, October 9. Cover scan and text by Clara Fox, ex-adventuress aka Judy Andrews. Thanks Judy!!! This is a real gem!